Suddenly with the aid of Facebook I am in contact with people I have not thought about nor heard from in forty or fifty years. I have discovered three or four people from my past who turn out to be interesting, agreeable, thoughtful souls with surprising insights. I find myself suddenly liking these people who I only knew casually in high school or college because (who would have guessed?) they share my views and opinions at virtually every turn. There is nothing new, of course, about divisions, arguments, and heated conflict between political or theological opponents. Church history is littered with the nastiness that Christians have exercised towards each other. We Americans frequently imagine that all of our sainted Founding Fathers were civil to each other, but try telling that to my friend Jim Elson who has studied how downright mean Thomas Jefferson was to Patrick Henry. And that is just one example of a number of estrangements and hostilities that lodged in their hearts. When we go through a period of tea-bagging and angry demonstrators at town hall meetings, it is easy to forget the horrors of even relatively recent things like civil rights demonstrations and anti-war protests in the Viet Nam era. Nonetheless, I suggest that, although it is neither novel nor distinctive, we are in fact living during a time of folly. Our institutions, like Congress, creaky and cantankerous, are unable to chart a coherent course for the future and to implement it. News media have a few things in their arsenals that they overuse: mockery, sniping, lampooning, trivializing, and masquerading at being fair and balanced. We have now seen that the machinery of capitalism is vulnerable to excess and collapse, and if you are noticing carefully, you can see how, like a monster that is wounded but not dead, it is reviving to continue devouring whomever it can. The populace wants to believe that there are simple answers to complex questions. They continue, against compelling evidence, to argue that there is nothing wrong with our environment, nothing basically wrong with our health care system, nothing fundamentally flawed about our energy policy. People fling about old bromides such as the epithet “Socialist!” as if to do so immediately negates the thing thus labeled. And, equally foolish, people like me trick ourselves into thinking that having a rational discussion is an actual possibility in a climate of irrationality. We actually have among our treasures in Judaeo-Christianity a tradition that addresses such situations as the one we are in. It is the wisdom tradition. You heard a snippet of it this morning in the Old Testament lesson from the Book of Proverbs. Unlike other traditions in the Hebrew scriptures, the wisdom tradition is at once more skeptical (the Torah and the Prophets never are) and more practical. In fact, the wisdom tradition is, to a great extent an ancient Hebrew philosophical theology. The books of Proverbs, Ecclesiastes, Song of Solomon, Wisdom, and Sirach are intended as means of instructing people in how to live good lives. The Book of Job is a drama which questions the easy answers of prevailing theology. Job promotes serious inquiry into the nature of good and evil, and suggests that situations are far more complex than at first they seem. Wisdom literature at first glance looks as if it is just another collection of folk sayings, full of competing proverbs and simplistic answers. Some of it may be. But when one actually reads it, particularly after reading, say, Deuteronomy, one finds a fresh perspective on things. God, for example, is not cast in the mold of an old man frequently getting upset over human events. In fact, the wisdom writers often use a word for “God” that connotes a being who creates and sustains the universe and brings all human acts to completion. Wisdom writers assume a divinely implanted order in the universe, encompassing both nature and human nature. But what is Wisdom? It is hard to pin down, because it means a cluster of things. First, wisdom is practical counsel on how to live a good life, beginning with respect and awe for the Lord. And yet, human wisdom has its limits. Wisdom is both something you must work at, and is at the same time a gracious gift from a gracious God. And fourth, the wisdom writers reflect on wisdom itself, frequently speaking of wisdom as an attribute of God, or even as a kind of being that they think of as a female who shares with God in the governance of the universe. But, as our lesson from Proverbs shows today, wisdom literature sometimes sets forth a teaching of two distinctly different and mutually exclusive ways. One is the way of wisdom, sometimes known as Lady Wisdom. The other is the way of foolishness, of stupidity, of wrong action or evil intention, sometimes called the way of Dame Folly. These are not invariably contrasted nor consistently thought of as competing. But they are two distinct ways of living. One sermon cannot tell you all about being wise. You will have to read and study the wisdom books for that. But what we can do is to see that wisdom offers a way of navigating stressful and conflict-heavy situations, and we can test whether we want to practice it. 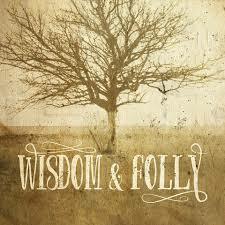 The way of wisdom has enormous potential for helping us not to get stuck in lots of foolishness swirling around us. In fact, without putting too fine a point on it, I want to suggest that our ministry, mine and yours, especially in a time when foolishness or folly seems to be the situation du jour, is to drink deeply from the spring of wisdom, to be centered in wisdom, and to be guided by it. Notice that I don’t expect our ministry to dissuade all the fools going off on various tangents in all directions not to be foolish. It is perhaps true that, if we picture Wisdom as a woman, we can imagine her sending out servant girls to call out to the simple, “You that are simple, turn in here. Eat my bread, drink my wine. Lay aside immaturity and live, walking in the way of insight” (Proverbs 9:1-6). But I doubt that we would get very far if we just adopted the script of biblical Wisdom. So what would happen if we “steeped ourselves” in wisdom? How would we likely behave in, for example, the health care debate? To begin with, a disclaimer. I am not advertising myself as an expert at this or believe that I have accomplished it. Not only that, but I publicly confess to practicing some of the folly that on the whole causes me to retch. But, I think, first thing to do is to get in touch with the sources of wisdom. Read and re-read the wisdom literature and reflections upon it. Read and listen to other sources as well. One of the wisest books in the world is the Tao Te Ching, the ancient Chinese wisdom of Lao-Tzu. Much of it, not surprisingly, accords with Hebrew wisdom. Get acquainted with the poetry of Rumi, the Islamic poet of the Middle Ages. And these are only a beginning. In addition, stay in what I would call “a state of wisdom,” a mind-set, an attitude. It is marked by careful inquiry, always doing your homework, reading and reflecting on things. In the words of Kipling, keep your head when all about you are losing theirs. Out of that grows another behavior. Ask questions. For example, one of the things I have been trying to do of late is instead of shouting people down, simply ask questions with the aim of getting them to clarify their positions. “All right, so you don’t like a particular plan that is being proposed. Do you agree we should have health care? Who do you think should be left out? Really? You would leave illegal immigrants out? So what about the child of an illegal immigrant who has been taken to the ER with a ruptured appendix? How would you handle that? There is no need to do anything much more than ask questions. This is not necessarily for the purpose of converting anyone to your point of view, but sometimes it does encourage people to think and that is a good thing. And that leads me to my next suggestion. Know what you believe and why. Our friend Jim Wallis of Sojourners, who has had enormous influence on getting people, especially evangelical Christians to re-think their positions on poverty, for example, did not exert influence simply by asking questions without having a very clear position himself. Know what you believe. Know why you believe it. Be able to state what it is. And, if you are Christian, do not be afraid to say that, “My faith—or my understanding of the gospel—leads me to believe that such and such is the right thing to do.” That is called bearing witness. It is not antithetical to being wise. We are not called upon to make all the decisions or to know all the answers or to be able to solve all the problems of the day. We are, however, charged with working for the spread of God’s reign, and that means working and giving and praying and investing in those things and spaces where Justice can be clothed with might and where human needs can be met and where hurts can be healed. Our baptismal covenant sets the tone and pattern of our ministry with our commitment to seek and serve Christ in all persons, loving our neighbors as ourselves. It leaves no question as to whether we are to strive for justice and peace among all people, respecting the dignity of every human being. These things are not optional, and they require no apology. How can you very firmly and clearly let your family, friends, Facebook acquaintances, co-workers, neighbors know that the values we collectively call “the Kingdom of God” or “the Reign of God” are important to you? And finally, a part of wisdom is never to be so sure you are right that you fear questioning your own assumptions. Someone once told me that the signature phrase of an educated thinker was the use of five words: “it seems to me that….” It is a way of acknowledging, “Hey, I could be wrong,” and you do it, even when somebody comes back at you saying, “You sure are.” You are wise to that, and you stay wise, for God’s sake.